The Airport Express is one of the lines of the Hong Kong MTR system. It links the principal urban areas with the Hong Kong International Airport and the AsiaWorld–Expo exhibition and convention centre. It is not primarily a rapid transit or metro line but a premium-fare express service for the airport and exhibition centre. It uses specially designed rolling stock intended to provide levels of comfort similar to that found on an airliner. The average maximum speed between stations is 200 kilometres per hour (120 mph). It is the only rail link to the airport's terminal. It runs parallel to the Tung Chung Line, a traditional rapid transit line, from Hong Kong Station to just south of the channel between Lantau Island and Chek Lap Kok Island, on which the airport was constructed. The line continues to the airport and terminates at AsiaWorld–Expo. The Tung Chung Line terminates in the adjacent Tung Chung new town, with bus service to various areas at the airport, including the passenger terminals. The journey from Hong Kong station to the airport takes 24 minutes. The line is coloured teal on MTR system maps. In October 1989, the Hong Kong government decided to replace the over-crowded Kai Tak Airport, located in Kowloon, with a new airport to be constructed at Chek Lap Kok. The government also invited the Mass Transit Railway Corporation to build an express line to the airport. The project began when the Chinese and British governments settled the financial and land agreements in November 1994. The Lantau Airport Railway was developed as two separate MTR lines, the Tung Chung Line and the Airport Express, with the two lines sharing tracks in some sections. It cost HK$35.1 billion. The Airport Express began service on 6 July 1998, the opening date of the new Hong Kong International Airport. The line initially terminated at Airport Station and the entire journey time was 23 minutes. With the opening of Sunny Bay Station on the Tung Chung Line in June 2005, the total journey time between the Airport and Hong Kong Stations was increased to 24 minutes. With the opening of AsiaWorld–Expo, the line was extended to AsiaWorld–Expo Station on 20 December 2005 and a journey on the entire route takes 28 minutes. The Airport Express line runs from Hong Kong Station in the Central and Western District, crosses under the harbour to West Kowloon and stops at Kowloon Station. The line then runs along the western side of the Kowloon peninsula, crosses over the Tsing Lai Bridge to Tsing Yi Island, and stops at Tsing Yi Station. The line continues on the Lantau Link and runs parallel to the North Lantau Highway to Airport Station before terminating at AsiaWorld–Expo Station. The line shares tracks with the Tung Chung Line only in the cross-harbour tunnel and from the Lantau Link through the split before reaching the airport island. The two lines have their own tracks and platforms at all stations. The Airport Express offers more spacious and comfortable trains and stations than other MTR services. On the trains, there are luggage racks next to each door, and each seat is equipped with in-seat loudspeakers for the current news, advertisements and announcements shown on the LCD televisions in front. The Airport Express provides In-Town Check-In at the Hong Kong and Kowloon stations, where passengers on flights with selected airlines can receive boarding passes and check luggage, and travel to the airport bags-free. Each train has a special baggage car and the luggage is scanned in bulk by a Mechanised Automatic Explosive Detection System. Luggage trolleys, wide fare gates, and free porter service are available at all stations except AsiaWorld–Expo to help passengers with baggage. The Airport Express Shuttle Bus is a free service provided exclusively for Airport Express passengers at Hong Kong or Kowloon Stations, connecting them with major hotels in the Western District though Quarry Bay on Hong Kong Island and the Yau Tsim Mong District and Hung Hom Station in Kowloon. Before boarding, proof of eligibility must be shown, including Airport Express train ticket (Single Journey, Same Day Return, Round Trip, Airport Express Travel Pass), Airline ticket / boarding pass, Airport Staff Octopus card, AsiaWorld–Expo entry pass or event ticket. WiFi are available on all Airport Express carriages, while charging service are assigned on first and last carriages. USB and electric socket are provided for charging mobile electronics. The Airport Express visual identity, which includes the logo, vehicle livery, signage, route maps and passenger information, was created in 1999 by Lloyd Northover, the British design consultancy founded by John Lloyd and Jim Northover. Inside the Airport Express with the Entry/Exit Path, along with the Baggage Compartments. The journey status can be seen above the compartment view. The interior has since been updated, with a new indigo carpet and the grey seats replaced with purple seats. Fares on the Airport Express are substantially higher than main line fares; a separate fare system is used for this line. Single trip or same-day return trips between the Hong Kong, Kowloon and Tsing Yi Stations to Airport Station cost HK$115, HK$105 and HK$70 respectively. Return tickets within 30 days cost HK$205, HK$185, and HK$120 respectively. Tickets are available at all MTR stations and the MTR online booking service. Although no entry gates are provided at Airport Station, travellers must still buy tickets from the ticket machines located in the Arrivals Hall, on platform 1 of the airport before boarding the train or at destination platforms. Various discounts and rewards programmes are available, such as Group Ticket Discount, free taxi connections, Rewarding programme, Asia Miles programme, etc. Passengers may also buy discounted tickets from local travel agents. Discounts are available for groups of two to four people. Hong Kong residents can also obtain discount coupons, such as those sent from credit card companies. Discounted fares are available to airport staff to encourage commuting on the Airport Express. Same-day return discount will be given to Octopus Card users who have stayed in AsiaWorld–Expo for at least one hour. The discounted fare costs HK$72, HK$64, and HK$42 from Hong Kong, Kowloon, and Tsing Yi Stations, and includes a free connection with other MTR lines. A single trip from the Airport to AsiaWorld–Expo is HK$5. Airport Express passengers using Octopus cards can connect with all other MTR lines for free in conjunction with the Airport Express journey within one hour of arrival at an Airport Express station. In March 2010 the MTR began to replace the magnetic tickets used for single, group, and multiple journey tickets with new "smart tickets" that contain a memory chip. The new system was in full operation by 5 June 2010. Due to the high fares and small catchment areas of the Airport Express stations, some travellers may instead choose to either use the cheaper, local Tung Chung Line combined with a bus route, or make their entire journey by bus. Patronage on the Airport Express is cannibalised by the Tung Chung Line running mostly on the same track. The Morning Express Service is a special promotional service, allowing passengers from Tsing Yi and Kowloon stations to travel to Hong Kong Station every day (excluding Sundays and public holidays) from 7am to 10am for HK$20. Airport Express trains depart every 10 minutes from the start of service (05:54 from Airport and 05:50 from Hong Kong) and every 12 minutes from 23:28 (from Airport) and 00:00 (from Hong Kong) until the last service 00:48. The Airport Express, along with other MTR metro lines, is monitored by the Operations Control Centre in Tsing Yi. The Airport Express is served by 11 A-Stock trains built and assembled by Construcciones y Auxiliar de Ferrocarriles in Spain while Adtranz contributed control and traction equipment. These trains were made up of seven cars until 2003. To cope with the extra traffic demand derived from the opening of AsiaWorld-Expo Station, an additional car was added to each train to form a total of eight cars. If future demand increases, trains on the AEL are capable of running with ten cars. In service, the trains travel at a maximum speed of 200 km/h (120 mph). The train interiors were refurbished after ten years in service, with the grey seat covers being replaced with purple and green ones, and a new indigo carpet installed. In Late-1998, Leon Lai shown a music video of MTR Airport Express line for the song, “Happy 2000”, which includes the interior of the A-Train. When British Hong Kong was planning to build the Airport Railway (Tung Chung Line and Airport Express) in the 1990s, which was a few years before the handover to China, the Chinese government raised concerns about the effect of the project on the territory's fiscal reserves, which eventually forced the Hong Kong government to reduce the cost of the Airport Railway. The resulting changes made to the design imposed limitations on the level of service on the line. The line was originally designed to be entirely quadruple-tracked, but instead features only two tracks within its cross-harbour section and between Tsing Yi and Tung Chung New Town due to lack of money. As a result, signal failures affect both the Tung Chung and Airport Express lines. The Lantau Link section of the line (consisting of the Tsing Ma Bridge, Ma Wan Viaduct, and Kap Shui Mun Bridge) only allows one train to pass through each direction at the same time, raising the minimum headway between trains to 2 minutes 15 seconds. As a result, some Tung Chung Line trains terminate at Tsing Yi during peak hours, instead of travelling the entire line. The signalling system is not capable of giving priority to Airport Express trains; as a result, Tung Chung Line trains stopping at Sunny Bay Station frequently impede Airport Express trains, which do not serve the station. The power supply system restricts the number of trains that can run between Kowloon and Lai King at once: a maximum of one Airport Express train between Kowloon and Lai King, and two Tung Chung trains between Lai King and Olympic. As a result, the shortest headway on the Tung Chung Line is 3.5 minutes. ^ "Patronage Updates". Mass Transit Railway Corporation. Retrieved 24 March 2019. ^ a b Davis, Chris (18 December 1997). "Rail "rocket" set to whisk passengers in comfort". South China Morning Post. p. 26. ^ a b Budge-Reid, Alastair J. (March 1999). "The Hong Kong Airport Railway" (PDF). Japan Railway & Transport Review (19): 36–43. ^ "COMPLIMENTARY IN-TRAIN POWER CHARGING SERVICE IN DESIGNATED CARS". MTR. Retrieved 21 April 2018. ^ "Archive". Lloyd Northover. Archived from the original on 27 May 2015. Retrieved 12 August 2015. ^ "Payment method and process". MTR Corporation. Retrieved 12 August 2015. ^ "Airport Staff Discount Fare". Airport Authority Hong Kong. Retrieved 12 August 2015. ^ "MTR > Tickets and Fares". www.mtr.com.hk. Retrieved 6 September 2016. ^ "MTR > Privileges and Complimentary Services". www.mtr.com.hk. Retrieved 6 September 2016. ^ "Information Update – July 2010". travel2hk.com. Retrieved 11 December 2010. ^ Yeung, Rikkie (2008). Moving Millions: The Commercial Success and Political Controversies of Hong Kong's Railways. Hong Kong: Hong Kong University Press. ISBN 978-962-209-963-0. ^ "Airport Express "Morning Express Service"". MTR Corporation. Retrieved 11 August 2015. ^ "OCC Migration". MTR Corporation. Retrieved 12 August 2015. ^ "Hong Kong Airport Metro". CAF. Retrieved 12 August 2015. ^ Ng, Yuk-hang (16 December 2008). "10-year-old Airport Express to get a facelift". South China Morning Post. p. 4. ^ (in Chinese) MTR Service Update (26 November 2012). "為甚麼東涌綫總是班次疏落？". Retrieved 28 November 2012. 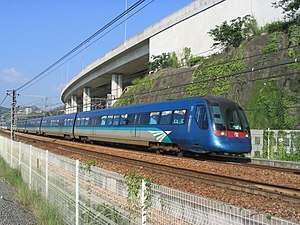 Wikimedia Commons has media related to Airport Express (MTR).